7-Day 1x1 Guided Kodiak Island Alaska Mountain Goat Hunt with Meals, Lodging and Trophy Care. Click here for details on this Kodiak goat hunt. 3-Day Wyoming Antelope Hunt with Meals, Lodging and Trophy Care. Email or call us for more information on this hunt. 10-Day 1x1 guided moose hunt with our expert outfitter in his exclusive Yukon wilderness concession. Click here for details on our Alaska Yukon moose hunt. We're now accepting reservations for our August 2017 Florida alligator hunt. This 3-night hunt on Florida's second-largest lake includes meals, lodging and trophy care. 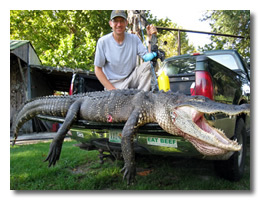 Click here to email us about our Florida alligator hunt. 12 to 14-Day 1x1 guided sheep hunt with meals, lodging and trophy care. Click here for details on this stone sheep hunt. The best way to see Africa...we will personally customize your safari to suit your wallet, desired number of hunting days and most importantly, your trophy room. Click here to hunt in South Africa. Our Popular Late Summer Guided Arizona Black Bear Hunt with Meals, Lodging and Trophy Care. Email or call us for more information on our summer black bear hunt. 10-Day Guided Yukon Mountain Caribou Hunt with Meals, Lodging and Trophy Care. Click here for details on our caribou hunt.